It's been a while since we blogged the government's ludicrous Night at the Opera Gershon "efficiency" cuts (see many previous blogs eg here). But they popped up again last week both in Darling's Pre-Budget Report, and a report from The Public Accounts Committee. And the two perspectives were somewhat different. According to Darling's version, everything's absolutely tickety. The Gershon programme has already delivered "annual efficiency gains of over £20 billion... and is on track to deliver the goal of £21.5 billion by the end of March 2008". Moreover, there have been "gross reductions of over 79,000 civil service and administrative and support related military posts towards the target of 84,150, with over 13,000 of these reallocated to frontline roles" (para 3.28). But according to the PAC, things are very far from tickety. Based on the most recent NAO probe (see this blog), only one-quarter of the reported cuts are "reliable". The rest are almost certainly a figment of the commissars' fertile imagination. So on that basis, of the claimed £20bn savings, real savings are about £5bn. Always remembering of course, that even those "savings" have probably only been achieved at the cost of a deterioration in service quality. For example, the PAC found that "savings" at the Department for Work and Pensions had increased the average time taken to process Jobseeker’s Allowance claims from 11 days to 16 days. And the Department of Health, while reporting over £1 billion of efficiency gains from reducing the average length of time patients stay in hospital, had taken no account the fact that emergency readmissions had risen consistently. One of the slipperiest concepts is the so-called non-cashable savings, which are meant to comprise reassigning people and resources from the dark back-reaches of the bureaucratic quagmire to work on "the front line". Here's a nice chart Darling produced to demonstrate how successful they are at squeezing "administrative" functions. Looks pretty neat, huh. 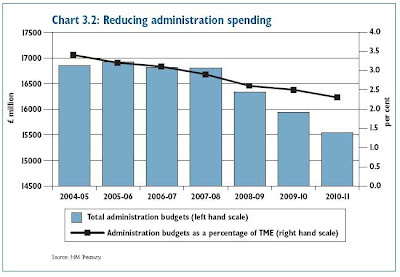 Admin costs down by one whole percent of public spending. The only problem being (apart from the obvious point that most of the "savings" are still to come) that the definition of what comprises the front line and what comprises admin is a tad hazy. For example, the PAC discovered that HMRC includes "managers, administrative support and IT staff that are employed in any of its business units" as being ‘front line’. In other words, the fall in admin costs is complete bunk. The whole Gershon nonsense remains an exercise in rearranging deckchairs. But what we taxpayers should be really angry about is that all over Whitehall there are people being paid by us to work on it.